I'm still a bit behind with some of my blogging commitments thanks to my recent illness. 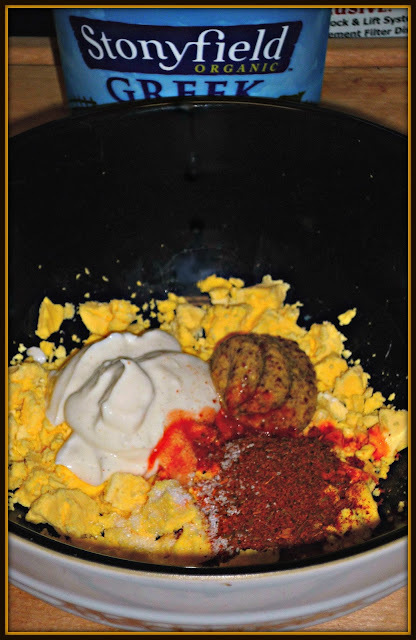 I thrilled to share what was supposed to be the July edition of the Stonyfield Clean Plate Club, featuring amped-up deviled eggs! Better late than never...and I promise that my recipe for Shrimp Remoulade Deviled Eggs is totally worth the wait! For this fun event, we were provided a fabulous stoneware Le Creuset Deviled Egg Platter and some handy Kitchen IQ plastic nested measuring spoons! Did you know that you can make deviled eggs with organic Stonyfield Plain 0% Greek Yogurt in place of mayo? You certainly can! The end result is a supremely creamy filling. The yogurt also saves a ton of fat and calories -- without sacrificing one bit of flavor in the process! I wanted to create a fun, spicy spin on traditional deviled eggs. My spicy Shrimp Remoulade Deviled Eggs take this comfort classic favorite down to the French Quarter for a fun big-flavor makeover. These amazing deviled eggs feature all my favorite shrimp remoulade flavors in a two-bite appetizer! 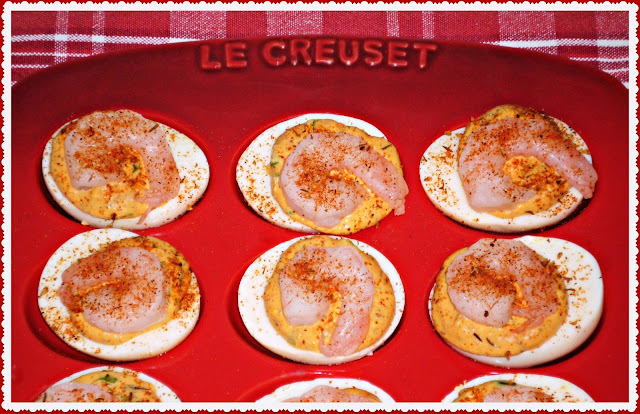 I loved using the gorgeous red stoneware Le Creuset deviled egg platter to serve my shrimp-topped deviled eggs. It holds two dozen deviled egg halves, and it's made from dishwasher-safe stoneware. 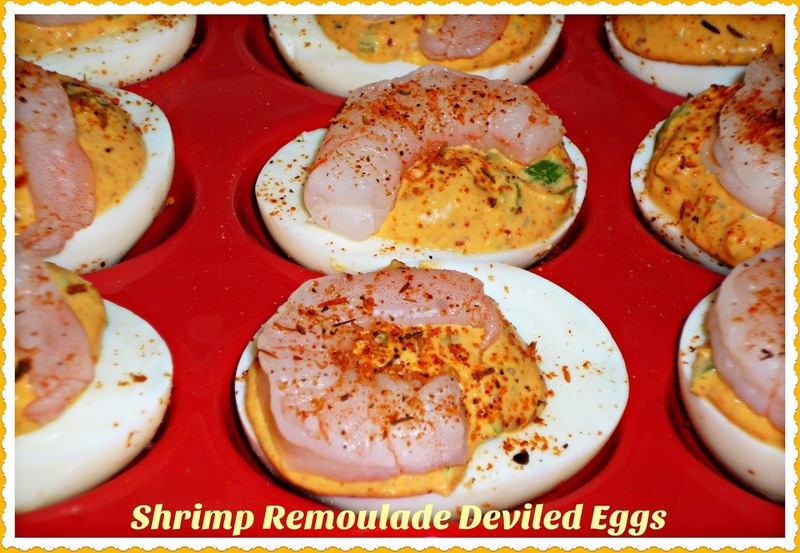 I just love these shrimp-topped deviled eggs! 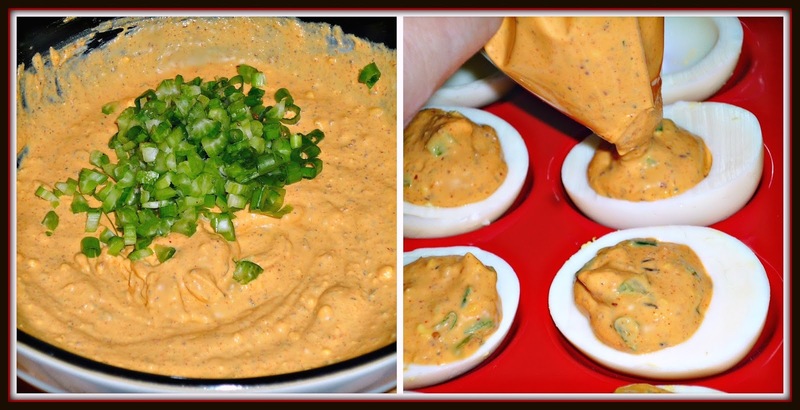 I'm thinking they would be a perfect addition to your upcoming Labor Day menu -- definitely a step up from traditional deviled eggs. As an added bonus, the yogurt-infused filling can be made up to a day ahead -- making assembly just before serving quick and easy for your party! Step 1: Cut the boiled eggs in half, and place the whites in the wells of a deviled egg serving platter. Place the egg yolks in a mixing bowl, along with the Greek yogurt, Creole mustard, hot sauce, and Creole seasoning. Use a fork to mash the egg yolks and completely combine all ingredients into a smooth filling. Step 2: Add the green onion and celery to the filling and stir to evenly incorporate. 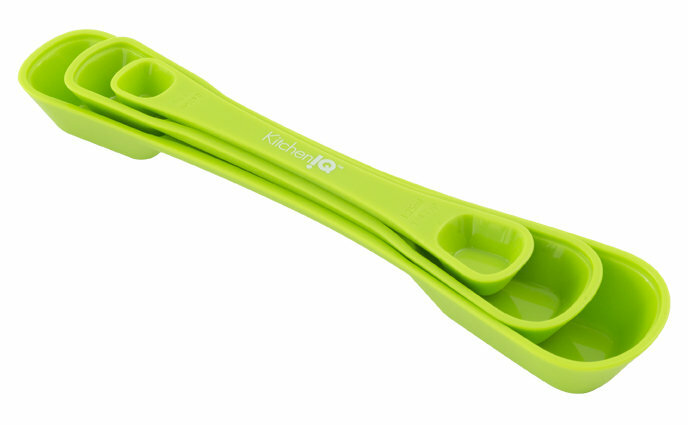 Spoon the filling into a large plastic zip-top bag, removing all of the air. Snip the corner off the bag and pipe the filling into each of the egg whites. 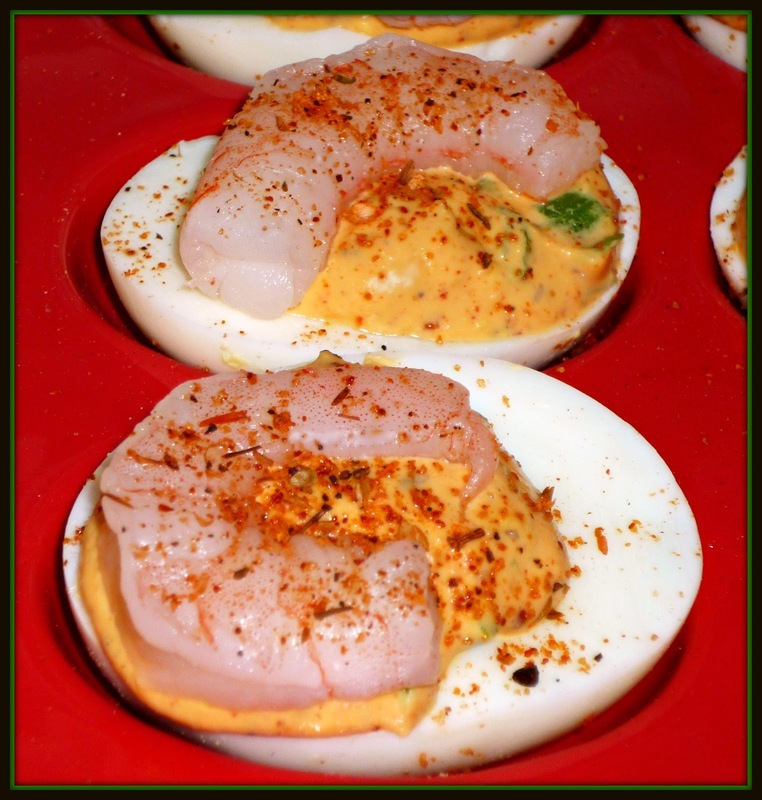 Step 3: Top each deviled egg half with one of the boiled shrimp and sprinkle with additional Creole seasoning. 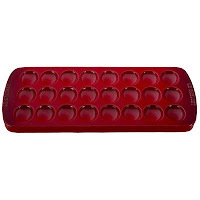 Serve immediately or cover with plastic wrap and store in the fridge until ready to serve. 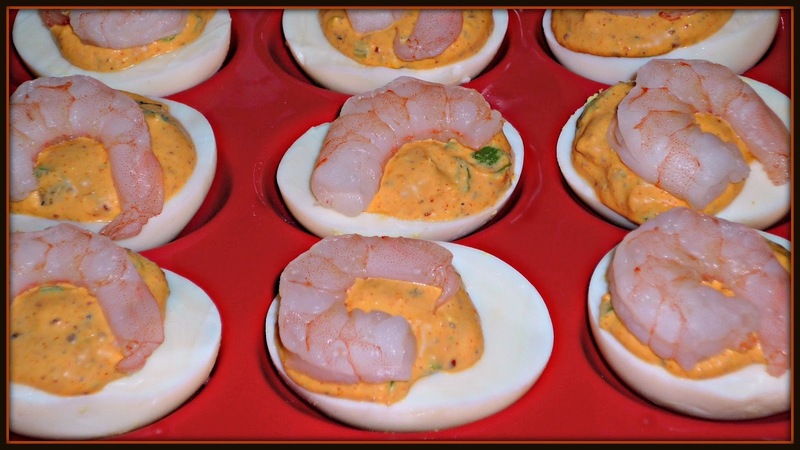 Y'all...these Shrimp Remoulade Deviled Eggs are a total flavor BOMB! The filling is quite spicy, so feel free to reduce the amount of hot sauce in half if you prefer your food on the milder side. The sweet boiled shrimp on top provide a good bit of cooling, though. The Stonyfield 0% Greek Yogurt keeps the filling super creamy and provides a nice bit of tang -- I guarantee you'll never miss the mayo. Take it from me...get ready for lots of compliments when you serve these babies at your next Summer party! Disclosure: This is a compensated post on behalf of the Stonyfield Clean Plate Club. I also received a Le Creuset deviled egg platter and Kitchen IQ utensils to facilitate this post. All opinions expressed are solely my own.